Representative Honours: Northern Ireland: Full (2009-date), 1 B Cap (2009), 11 Under-21 Caps (2009-2012), 16 Under-19 Caps / 1 Goal, 8 Under-17 Caps. Club Honours: (with Rangers) Scottish Premiership Runner-Up 2014/15. Capable anywhere down the left-hand side, though mainly a winger, Shane Ferguson is one of the few to have played for Northern Ireland prior to his eighteenth birthday, taking the field for a friendly in Italy in 2009. He has remained a regular in Northern Ireland's underage teams and played in the 2010 Milk Cup Elite final. 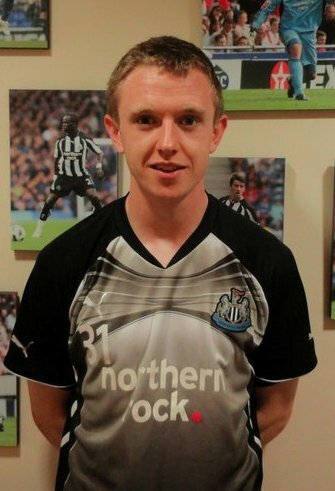 Ferguson made his Newcastle debut at left-back in an inexperience line-up on 25th August 2010 in a Carling Cup victory at Accrington Stanley. In the next round, again playing at left-back, he set-up Newcastle's opener in a 4-3 win over Chelsea. He made his Premier League debut as a substitute in a 5-0 win over West Ham in January 2011. Over the following seasons Ferguson's club career stalled, with injuries and loan spells meaning his Newcastle career never really got off the ground. He eventually permanently left St James' Park for Millwall in January 2016, having spent the first half of the season on loan there. Summary: 10(1)/0. Won 2, Drew 0, Lost 9. 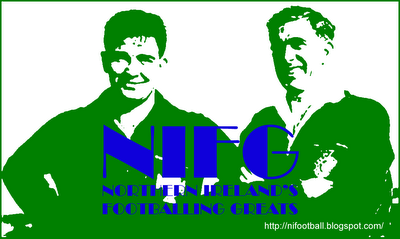 Photos by Roy Cathcart (NI kit) and Happy Days (Newcastle kit).